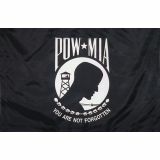 Show your respect and honor our American prisoners of war and those missing in action with these POW MIA Indoor Flags and Sets. These flags will set the tone of your organization and what is important to it.100% made in USA, the POW/MIA indoor flags and sets from Tuff Flags can be used as parade flags or mounted flags. Choose from single face reverse or double sided flags that are created to precision and elegance. Shop right away and take advantage of the best prices, quick shipping and much more! 100% customer satisfaction guaranteed! Our POW/MIA Indoor Flags & Sets stand proudly and can be used alone or as accompaniment with any other flags including the American flag or any other flag to show support to the return of our missing service men and women. 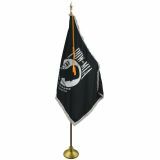 Purchase yours today to be pole mounted indoors or outdoors and make sure they're not forgotten.The fringed models of POW/MIA flags come in silver or gold and are perfect to show respect to the missing American soldiers. Made in 200 Denier Dupont Solar-Max nylon fabric and finished with rust proof, #2 brass grommets, these flags can be used as either a Parade Flag or as an Indoor Mounted Flag.